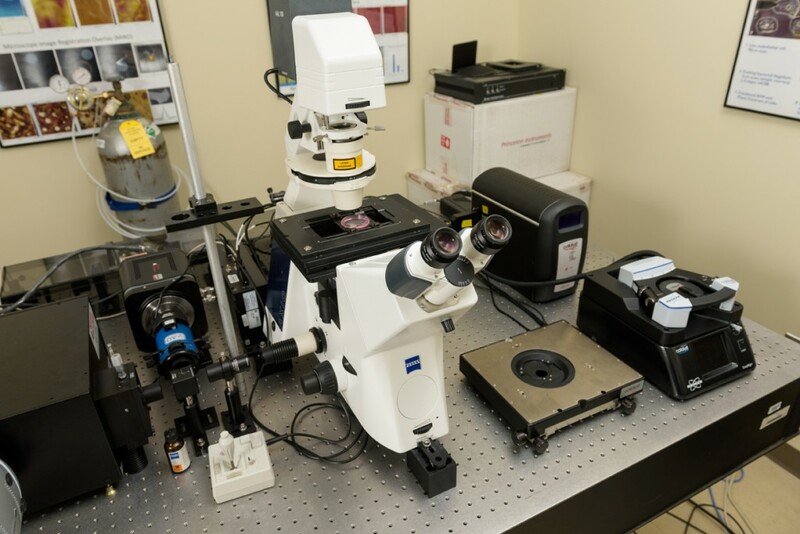 The MultiMode atomic force microscope can visualize a variety of samples such as polymers and nanoparticles. 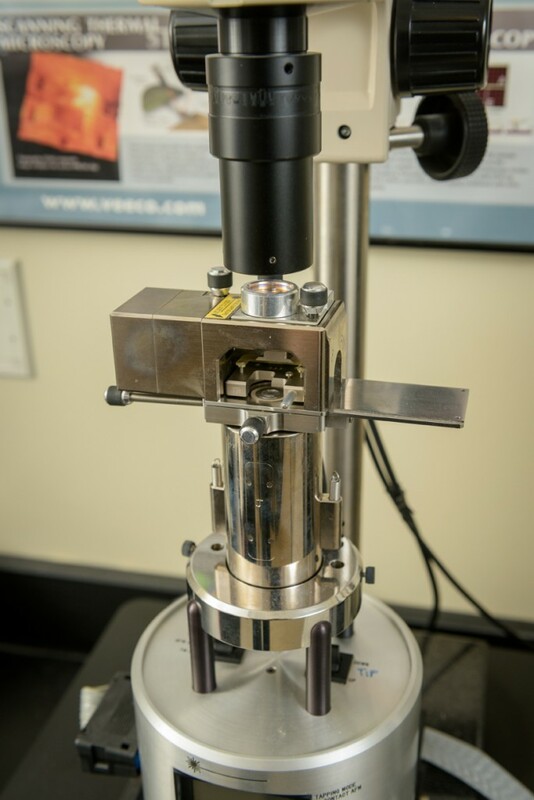 In addition to topography data, the AFM can also map the physical properties of materials including: elastic modulus, adhesion force, deformation and energy dissipation. The MultiMode is one of the most sensitive AFMs available. The AFM can operate in dry or wetted samples. This AFM has a optional stage heater. 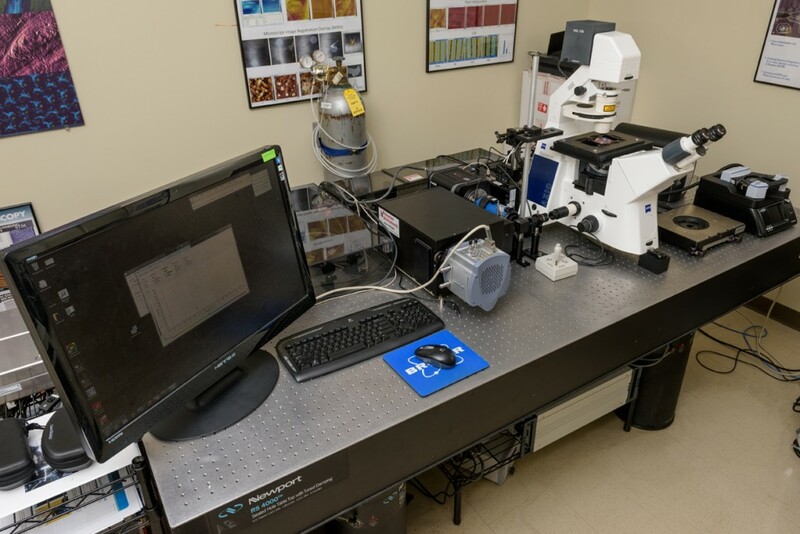 The Catalyst atomic force microscope can be used to simultaneously perform optical transmission imaging with AFM measurements. The AFM sits on top of a Zeiss Observer inverted microscope. Combined light microscopy and AFM is particularly useful for investigating live cells (bacteria, yeast, mamalian, etc). The AFM can be heated, and liquids can be perfused for long invesitgations. Images from the ligh microscope are collected by an electron multiplied CCD camera with >80% quantum efficiency, allowing single-molecule fluorescence measurements images during AFM scanning. measurements. Combined light microscopy and AFM is particularly useful for investigating live cells (bacteria, yeast, mamalian, etc). Fluorescence is typically excited using total internal reflection microscopy (TIRF), with 405, 488, 461 and 633 nm laser excitation. Images from the ligh microscope are collected by an electron multiplied CCD camera with >80% quantum efficiency, allowing single-molecule fluorescence measurements images during AFM scanning. Single-molecule Forster resonance enerergy transfer (FRET) measurements can be performed using the DualView system. The AFM sits on top of a Zeiss Observer inverted microscope. The AFM can be heated, and liquids can be perfused for long invesitgations of live cells.